I haven’t studied the doctrine of election for some time now. It’s simply one of those doctrines that no one can agree on. It’s controversial. At the same time, election is a concept in the scriptures. The question is: what does it mean? One of my students asked me to articulate the doctrine of election during a sermon series. What I decided to do was to lay out the options when it comes to election (commonly called unconditional election and conditional election) and let them decide. I’m not quite convinced I did a great job at it, but… alas, what can be done! ‘ll let you be the judge. R Scott Clark has a great discussion in his Recovering the Reformed Confession. He begins chapter four by explaining that Christian theology has a way of viewing reality that makes an important distinction between Creator and creature. This view of reality is commonly called analogical. Human, worldly, earthly existence is an analogy of God’s true essence or existence. Put another way, man is created in God’s image and likeness, but not in his essence. The world images and represents God, and we know him only through those images by way of analogy, not in his bare essence. Theology is then properly analogue speech. [There are a] number of biblical passages which indicate a conceptual framework in which God and human beings are regarded as analogues. This analogical conception is basic to Genesis 1:26, in which Adam is said to have been made in the “image” and “likeness.” In verse 27 the same language is repeated, but set in terms of Adam’s relations to another, a female person. As a created representation of God, as an image/likeness bearer, Adam was nothing, if not an analogue to God. Adam is called an image of God. He is a representation of him. He does not share in his essence. Rather, Adam is an “icon” of God’s true essence. What this means is that Adam represented and related to God by way of analogy. Clark goes on to argue that this is how all of reality is: it is a representation of God’s true essence. He cites the fact that the temple built under Moses’ leadership was a “copy” of the heavenly temple. What this indicates of course, is that there is a heavenly temple after which the earthly temple is built. Israel only had a copy, not the real deal. And, they worshipped and relate to God by way of the copy, not the reality (that is not to say that their worship wasn’t real, but only to say that they really worshipped God in the temple-copy, not the reality). Clark also cites Hebrews which calls the temple and priesthood under the old covenant a “type and shadow” of the true and heavenly priest and temple, Christ. The point of all of that is to say that we relate to God by way of analogy, of representations and copies that image him but do not show him in his essence. Now, why does God relate to us this way? Clark explains that God does it this way beacuse “the ‘finite is not capable of the infinite’ (finitum non capax infiniti)”. The infinite cannot be perceived by the finite. For this reason, God’s true essence is hidden to us. It is unknown. But because God actually wants to relate to us, he “condescends” to us through images and representations, much like a father relates to his child. As Calvin famously says, God “speaks baby talk” or “babbles” to us so that we can relate to him. Now what this means is that whenever we talk about God, we can only talk about him as he has revealed himself to us: through images, analogies, copies. We cannot know God in his essence; we must speak about God by way of analogy. And because we can only speak of God through analogy, as Clark explains, “there is a certain degree of falsehood in human speech about God” (Kindle Locations 2155-2156). We see [the as it were principle] at work in Heidelberg Catechism Q. 27. In answer to the question, “What do you understand by the providence of God?” we confess, “The almighty and everywhere present power of God, whereby, as it were, by his hand he still upholds heaven and earth.” We do not believe or confess that God, considered apart from the incarnation, can be said to have a literal hand. We recognize this as a metaphorical way of speaking about God’s providential work in the world. Yet we also recognize that, because of our finitude, in order to say something true about God we must use divinely authorized analogies to say something that entails a certain degree of falseness. (Kindle Locations 2156-2162). Properly, it is false that God has physical hands which he uses to hold up the universe. But the point is that this is analogue speech about God. We know that God sustains the universe. How he does it, and what powers he works, we simply don’t and can’t know. We only know by way of analogy. We know God “as it were”. Which is to say that we know God by comparing, imaging, representing, etc. We cannot know him in his essence; but in his grace he stoops down in images and copies to make himself known to us! I am studying the life and works of Thomas Aquinas for a history class I’m taking. So I figured I would do a few posts on Aquinas’ life and works. 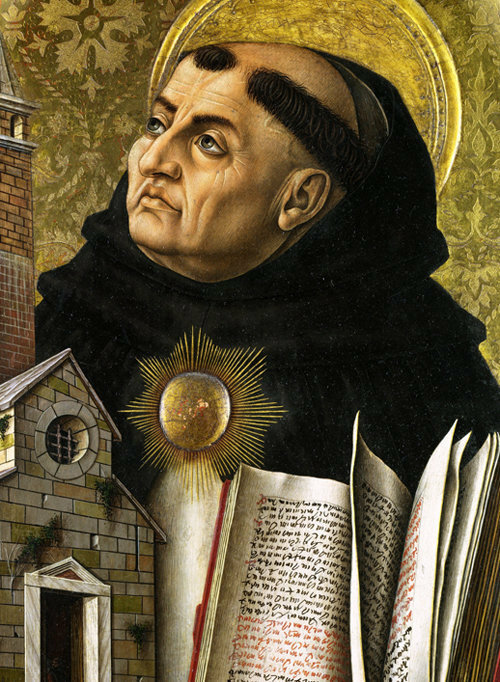 In this post I want to consider Thomas Aquinas’ life and contribution to the church. We also know that one of Aquinas’ relatives was the Roman Emperor. Because of his noble birth, his parents had planned to make him Abbot over the monastery in Monte Cassino. Marshall tells us that this monastic house was considered “the motherhouse of medieval monasticism…To be the Abbot of Monte Cassino was to reign as a prince” (Thomas Aquinas in 50 pages, 3). It was this influence that led Thomas to denounce his calling to be Abbot. Instead, Thomas would live in poverty, a beggar and traveling preacher — he would be a Dominican Friar! To be a Dominican, one would swear himself to poverty, to literally be a “dog for the Lord”, which is what Dominican means in Latin (Domini canes). At age 19, in 1244, he joined the order, and journeyed north to Rome to start his studies. His family, however, would not have it. During his trip, his own brothers (at the request of his mother) kidnapped him and locked him in their castle in Monte San Giovanni Campano. This “house arrest” lasted for one year; and during this time, his mother and brothers attempted to dissuade him from joining the friars. Understandably, it was because of this trait that Thomas struggled to integrate with his fellow students. Feser tells us that during those years, Albert the Great, seeing Aquinas’ great intellect, warned his class that “the Ox’s ‘bellowing’ would someday be heard throughout the world” (ibid, 4). How right he was! It was also during this time under Albert, that Aquinas was greatly influenced by Aristotle. And while Thomas loved Aristotle, the university was quite apprehensive to philosophy. In fact, in order to study him, Aquinas had to take an extra “track” at the university, because philosophy was considered a “secular” subject rather than theological. After graduating with a masters, Thomas Aquinas went on to teach in the university in Paris and in other Dominican houses for the next 13 years (1259-72). We are told by Ralph McInerny, that it was customary for Dominican masters to teach for a three year segment in the formal university, and then move on to teach in houses of the Dominican Orders. However, because of Thomas’ great intellect, he was invited to teach a second three-year stint (McInerny, Aquinas, 16-23). During Aquinas’ second stint teaching in the university of Paris, a controversy arose over the place of Aristotle and pagan philosophy in the church: a group of Aristotelians called the Averroists espoused a theory called the “two truth” theory, which argued that something could be true philosophically that is not true theologically — hence, two types of “truth”. Aquinas argued against this position, seeing the inherent danger. He ultimately argued that all truth is God’s truth, whether it be philosophical, theological, or scientific. I will take up this topic in another post. Thomas wrote many works under this method, with his most important being the unfinished Summa Theologica, which he began in 1265. On December 6, 1273, Thomas decided to stop writing. Some biographers conjecture that he had a kind of mental breakdown. But it was a mystical experience that silenced Thomas. After what he had seen, he told Reginald (his secretary), everything he had written seemed mere straw. He could not bring himself to complete the Summa (ibid, 25). Apparently a heavenly vision halted Thomas’ writing. Thomas never spoke of the details of what he saw, but the magnificence of it made his writings seem inadequate. Fortunately, some of Thomas’ disciples supplemented his incomplete Summa with other commentaries of his after his death. Toward the end of his life, Thomas was summoned to a council in Lyons in 1274. While on his way to that council, he hit his head on a branch, and died soon after from complications on March 7, 1274. He was only 49 years old when he died. What was Aquinas’ greatest contribution to the church? GK Chesterton is helpful with this question: he says simply that Thomas “reconciled Aristotle with Christ” (Dumb Ox, 8). What he means is that Thomas Aquinas synthesized philosophy with Christianity. Many Christians then (and today) did not believe that reason and philosophy could be trusted or reconciled with the Christian worldview. However, Thomas argued that this was not the case. Faith and reason, in other words, were what Thomas labored to reconcile. We will go on in later posts to examine just what that means. During the first five centuries after its conception, the church was forced to deal with several different heresies concerning Christ. In fact, the church was forced to formulate a concise universal statement about the nature of Christ (Nicene Creed), because of the many differing heresies proposed during its infancy. Most of these heresies centered around the nature of Christ, his humanity and divinity. How divine was Christ, really? How human was Christ, really? And how do these natures interact with one another? By the fifth century, it became orthodox to believe that God in Christ had assumed a full human nature for our redemption. The eastern church had coined a phrase which is still prominent today: “God became man that man might become God” — and by that, they meant that God became fully man, that we might participate fully and redemptively in His very life. The thought was that if God wanted to assume and redeem mankind back into fellowship with him, he needed to become fully human in the incarnation to raise us back to glory. One bishop name Apollinaris (after whom was named this heresy), however, was uncomfortable with affirming that God the Son became fully man. To him, to become fully man was to taint the divine nature. Apollinaris thus promoted the view that the divine nature of Christ “replaced” the human soul and mind, protecting him from the corruption of human sin. One can almost picture the human nature of Christ like a puppet. The problem with this view of course, was that it made Christ not fully human. He merely appeared to be human, but was in fact only outwardly human, not having a human mind or soul. The early church rejected this notion for one massively important reason: if Christ was not fully human, he could not fully redeem the human race! If the goal of redemption was to welcome fully humanity back into fellowship with the Godhead, how can a half-human Christ redeem whole humanity? Gregory of Nazianzus, theologian of the fourth century, replied famously to Apollinaris by saying: “what has not been assumed has not been healed”. If Christ did not assume a “fallen” human mind, or soul, how can the mind and soul be redeemed? The answer is that it cannot! had to be made like his brothers in every respect, so that he might become a merciful and faithful high priest in the service of God, to make propitiation for the sins of the people”. Christ had to be made like his brothers “in every respect”. What this means is that while God the Son had a fully divine nature, he also had a fully human nature. For this reason, Christians affirm that God the Son is one person with two natures. When asked who was acting in the person of Christ, we answer the eternal Logos. But when we ask about the what, we must reply: full divinity and full humanity. Our church recites the Apostles’ Creed every other week. It’s a beautiful, ancient creed. I love its Trinitarian formula: God the Father is maker of heaven and earth. Jesus Christ, the begotten-Son, is redeemer. The Holy Spirit brings the saints together into one holy catholic church. As beautiful and ancient as it is, many people are thrown off by one line which comes under the office of the Son. It says that after Christ had died and was buried, that “He descended into hell”. Jesus descended into hell? What does that mean? What usually comes to mind here is Christ dying and then going to the fires of hell to be further tormented by the devil. This imagery would reasonably detract many people. Is this what the creed really means by “he descended into hell”? 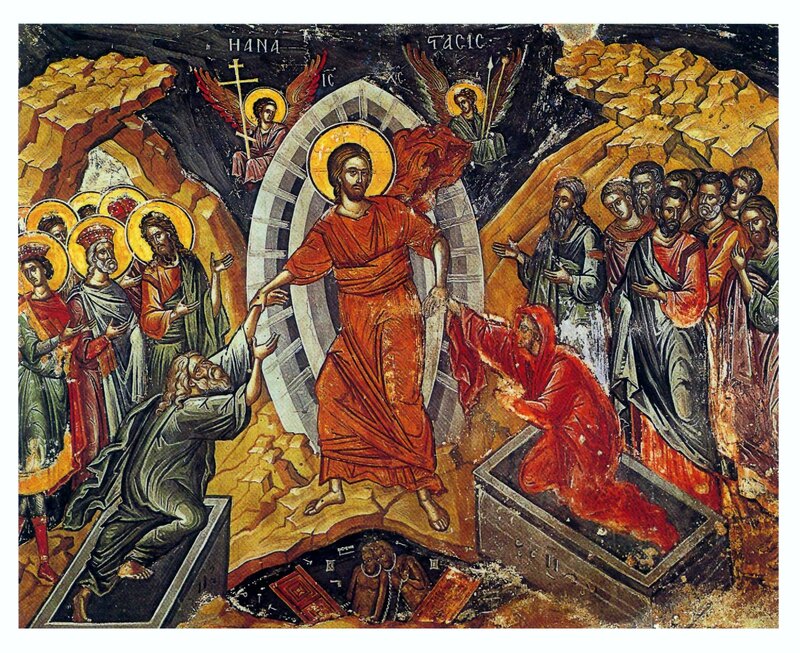 First, the Reformed churches have historically rejected any notion that Christ went to hell after his death and during his three days in the grave. Rather, the Reformed churches pose that Christ’s descent into hell refers to the anguish he experienced on the cross. Christ, being separated from the Father, bearing the sins of the world, experienced eternal torment for mankind on the cross. Why is it added: “He descended into hell”? Christ has experienced hell that I might not. And of course this is true. The Luther church, however, would disagree with this understanding of the creed. The Lutherans understand Christ’s descent into hell under the rubric of his victory over satan and demons. Lutheran Henry Jacobs, in his Summary of Christian Doctrine, questions 39-43, says that “the Reformed Church regards ‘the descent into hell’ as a part of the humiliation; the Lutheran Church, as we shall see, regards it the first grade of the State of Exaltation”. Jacobs classifies Christ’s descent into hell as part of his exaltation (i.e. victory over sin and death) as opposed to his humiliation (i.e. experience of wrath and the cross). How can this be so? Jacobs brings in 1 Peter 3:18-19 as proof that when Christ descended into hell, it was not to suffer, but rather to pronounce victory over the demonic spirits. So, during the three days in the grave, Christ descended into hell to “destroy the power of hell”. This was on the basis that Christ had defeated sin and death. The Catholic church affirms with the Lutherans that Jesus went into hell, or Sheol, or the realm of the dead, however one sees it. But he went there “not…to deliver the damned, nor to destroy the hell of damnation, but to free the just”. Meaning, Jesus went to release the Old Testament saints into the beatific vision. According to this view, the Old Testament faithful could not enter into the divine vision until justice had been satisfied — the cross did just that. And so Jesus went to Sheol to preach victory and to release the faithful to heaven. The Catholic church provides 1 Peter 4:6 as proof of this: “the gospel was preached even to those who are dead, that though judged in the flesh the way people are, they might live in the spirit the way God does”. The gospel was preached even to the dead.” The descent into hell brings the Gospel message of salvation to complete fulfilment. This is the last phase of Jesus’ messianic mission, a phase which is condensed in time but vast in its real significance: the spread of Christ’s redemptive work to all men of all times and all places, for all who are saved have been made sharers in the redemption. It is important to note that the Lutheran church doesn’t deny that Christ released the faithful into the divine presence. Henry Jacobs explains that “we may regard it probable that the proclamation of victory announced to one class to their terror was made to another class, to their joy and triumph.” However, he prefaces that “we dare not think of those who departed in faith as until then ‘in prison. '” In other words, the Old Testaments saints may have been freed into the beatific vision, however, they were not in “prison” (1 Pet 3:19) as the demonic spirits were. So these are the three main interpretations of Christ’s descent into hell. While I do affirm the Reformed position, that Christ experienced hell on the cross, I must admit that that position has weaknesses. What about Peter’s description of Christ’s descent? What about “preaching to the dead”? For this reason, I also affirm that Christ did descend into Sheol, or hell, to pronounce his victory over sin and death. This pronouncement, I presume, both condemned the demonic spirits, and redeemed the Old Testament saints. It was the last phase of Christ’s mission, after which he was resurrected and ascended to the right hand of the Father.